We are Concordia on the Lake. At Concordia on the Lake we offer rental apartments and cottages for seniors with an active, independent lifestyle, an emphasis on socialization, community involvement, and cultural enrichment. Visitors can either call us or fill out the online contact form. We use this information to contact you and answer any questions you have about our services. We do not share this information with any third party organizations. We do not share your contact information and messages with anyone outside of Concordia on the Lake unless you have requested a referral and introduction to another organization. 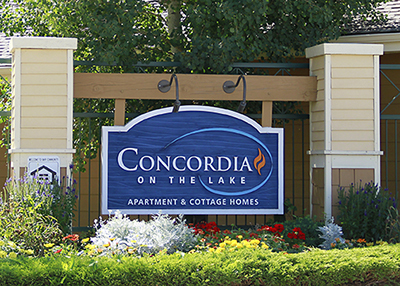 If you become a resident at Concordia on the Lake, then your information is added to our client management software and that information is private according to the rules of HIPAA (Health Insurance Portability and Accountability Act) and not shared outside of Concordia on the Lake, except to provide services for your benefit that you request. For individuals asking senior service questions: If you fill out a contact form with a question, we answer your question to the best of our ability. We do not share your contact information with anyone outside of Concordia on the Lake unless you have requested a referral and introduction to another organization. Your email is kept in a Microsoft Outlook account for 120 days.